I thought human teen-dom was tough. My own experience of navigating mean girls, not having two Polo shirts to wear at the same time (80s kids called that doubling-up) and picking the wrong boy to kiss after school pale in comparison to the rites of passage nature inflicts on its non-human inhabitants. Take salmon, for example, as a case of one species’ rough initiation to adulthood. Orphaned as hatchlings, they make an epic journey from inland rivers to the sea and back again. It is an odyssey fraught with peril, as they learn to avoid predators and forage for food, only to have to find their way around manmade obstacles like dams, mining pits and pumping plants. 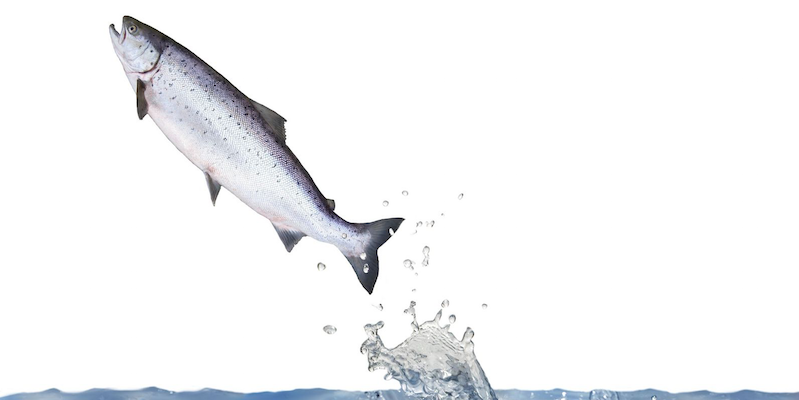 Of course, salmon may not be the most sympathetic creatures in the world. A search for videos and photos reveals more interest in serving the fish for dinner rather than enjoying images of it in its wild habitat. But in California, the health and well-being of salmon gets a lot of attention from water agencies and environmental groups alike, who monitor its population as an indicator of the ecosystem’s health. 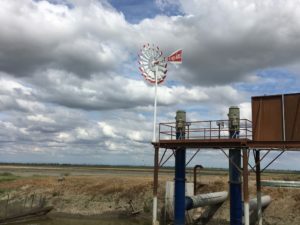 I recently had the chance to take a tour of several salmon recovery projects around the Sacramento Valley’s Yolo Bypass and came away impressed with the fresh thinking being applied to solving some big, systemic problems. The Nigirl Project at Knaggs Ranch, after the water has gone. Let’s talk about the Nigiri Project, one of three stops on the tour I took. Despite its name, the project has nothing to do with sushi, but everything to do with helping young fish prepare for their journey to the sea. The name is a play on the Japanese term nigiri, which means fish over rice, which is a perfect description of what the project does. Project managers flood rice fields not far from the Sacramento airport with water from the Sacramento River during winter months, and juvenile salmon are captured and brought there for several weeks. The fish grow large, thanks to the nutrients in the water, before they are put back into the river to continue on their way. It’s a strategy that Asian countries have used between planting seasons for many years, and it seems to be working in California as well. The salmon living in the flooded rice fields thrive and get plump on microorganisms in the water, while their counterparts in the river do not. Since beginning the project in 2012, project collaborators California Trout and Cal Marsh & Farms have also been able to replicate these results across five different agricultural floodplains throughout the Sacramento and San Joaquin valleys. It works because it mimics the more natural flow of the Sacramento River before flood management practices were put in place, and it’s good for the environment and for agricultural interests economically. The Nigiri project is just one of many innovative collaborations aimed at helping fish while benefiting agriculture. Todd Manley from the Northern California Water Association has an enormous list of them, some completed and some in progress, that are happening in the Sacramento Valley. Most are public-private partnerships that give hope to those who think gains can be made when differing sides work together, not against one another. 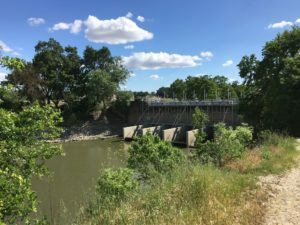 One we visited is a century-old water pumping plant on the Sacramento River that is being replaced with a new, state-of-the-art pumping plant that will employ screens and barriers that block young salmon from getting sucked into the pumps. The joint project by Reclamation District 2035 and Woodland Davis Clean Water Agency is one of the last remaining projects from a 20-year effort to protect threatened and endangered fish species while moving water to relieve nearby cities of Woodland and Davis from dependence on groundwater. Juvenile salmon aren’t the sole focus of these projects. The adults swimming upstream in the Sacramento River to spawn are kept on track and out of dead ends through a series of barriers that prevent them from taking the wrong turn out of the river and into natural drainage areas. Lewis Bair, general manager at Reclamation District 108, walked us through one of these projects near the popular fishing spot Knight’s Landing. It’s worth noting that the land here doesn’t even reside in RD108’s service area, yet the water agency chipped in just under a fifth of the $2.5 million cost for the improvements because it knows that nature doesn’t draw boundaries like people do. Bodies of water are connected, whether they are in one service area or another, so it makes sense to treat them in an integrated, interconnected way. With drought conditions ongoing in parts of the state, Mother Nature isn’t resolving the issue of water scarcity any time soon. Collaborative, forward-thinking projects like these are at least moving us — and those young salmon — in the right direction. Well done Reclamation District 108 and Nigiri Projects! If only environmental lawyers and defense funds would direct their enormous cash donor resources toward projects like these MORE species would be saved. The lawsuits disrupt the right kind of progress only to line the pockets of lawyers as they advance the donor class and political elite’s goal to privatize water and then turn it into gold. That Nigiri Project sounds really interesting. I bet it’s not just good for the salmon but also us mammals. The salmon probably eat mosquito larvae and so reduce mosquitoes as a disease vector – and an irritant.